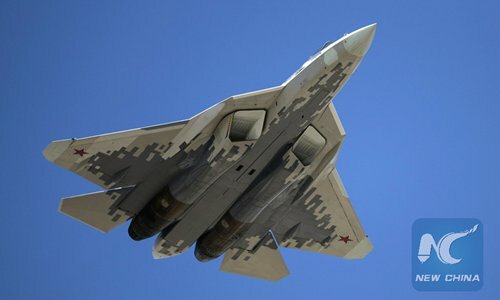 Although many Chinese military observers are pessimistic over Russia's latest fighter jet Su-57's capability, a senior Chinese warplane designer believes the Su-57 has a very unique concept, and China should learn from it despite the country already operating the J-20 fighter. The Su-57, Russia's fifth-generation fighter jet comparable to China's J-20 and the US' F-22, is usually considered not a true fifth-generation jet because of its "below-standard" stealth capability, according to media reports. This makes it at a significant disadvantage against Chinese and US counterparts, some military observers said. China has a long tradition of purchasing Russian warplanes, recently highlighted by an Su-35 deal. But as the country developed its own fifth- generation fighter jet, it does not need to buy or even learn from the "below-standard" Su-57. However, Wang Yongqing, chief designer of the Shenyang Aircraft Design Institute (SADI) under the State-owned Aviation Industry Corporation of China (AVIC), said the Su-57's overall capability is not bad at all. The SADI has developed a variety of China's fighter jets, including the J-11, J-15 and J-16. It is currently developing the FC-31 stealth fighter, which is made-for-export but was recently reported that it could become China's next-generation aircraft carrier-based warplane. Having an innovative aerodynamic design and capable of thrust vectoring control, the Su-57 attaches strong importance to supersonic cruise capability and super-maneuverability, and stealth is intentionally a second priority, Wang wrote in February in the Aerospace Knowledge magazine. The US' concept of next-generation aerial battle stresses beyond visual range attacks, but missiles capable of delivering such attacks have to travel for a while, a time window far enough for the Su-57 to make super-maneuvers and evade them, Wang said, noting that the Russian fighter is also equipped with special radars designed to detect the precise location of incoming missiles. With long-range missiles out of the question, the final showdown will eventually take place at close range, where stealth loses its meaning and super-maneuverability thrives, Wang said. Another unique design is the world's first side-facing radars in addition to the front-facing ones, Wang said. Combined with other radars and infrared sensors, the Su-57 is expected to find enemy stealth aircraft as early as possible. Russia might be limited by its industrial capability and might not be able to rival the US aircraft in specific or overall performance, but its concept is very unique, Wang said.